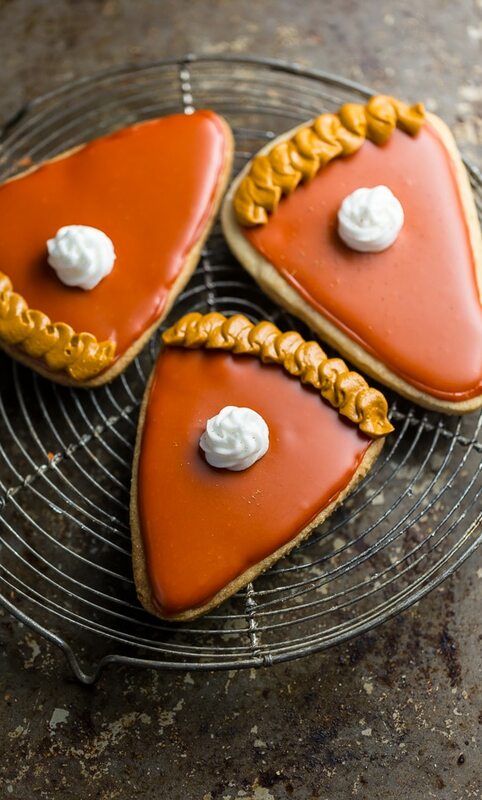 These Pumpkin Spice Cut-Out Cookies are dressed up to look like little slices of pumpkin pie! Does it get any cuter than this? Welcome PIE WEEK! Today’s pie is actually a cookie. But they sure look like little pie slices, don’t they?! 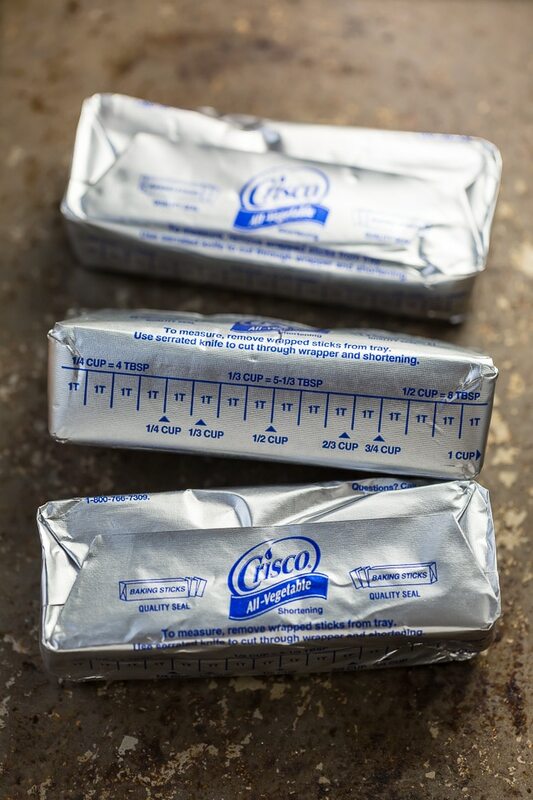 For this recipe, I’ve teamed up with my friends at Crisco®! Their all-vegetable shortening creates thick, moist, and airy sugar cookies that are easy to cut out and won’t spread all over the pan during baking. And the cookie dough requires NO chill time! How great is that? You can just whip it up, roll it out, and get baking! 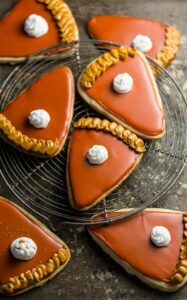 And if decorating the pumpkin pie cookies sounds a little too complicated, try making simple pumpkins instead! Or be like me, and make both. P.S. 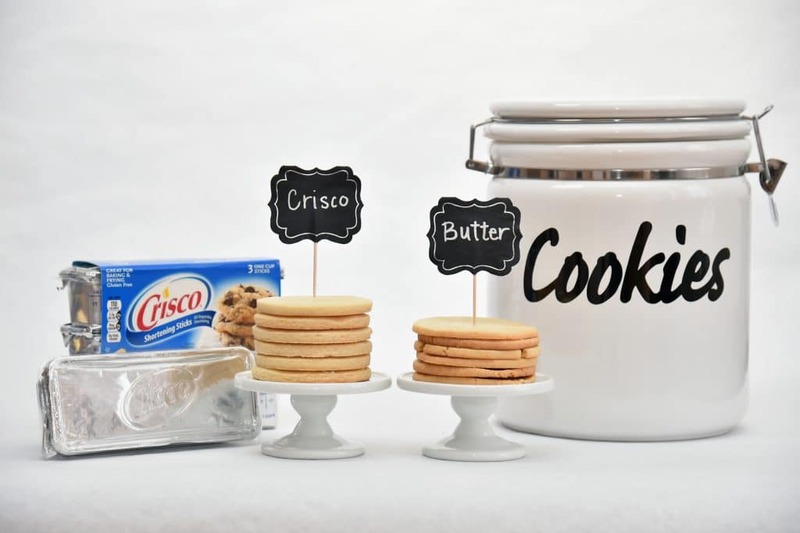 look how much thicker cookies made with Crisco® are! ↓ And they’re perfectly uniform in color. When it comes to baking, you gotta love a product that yields consistent results! 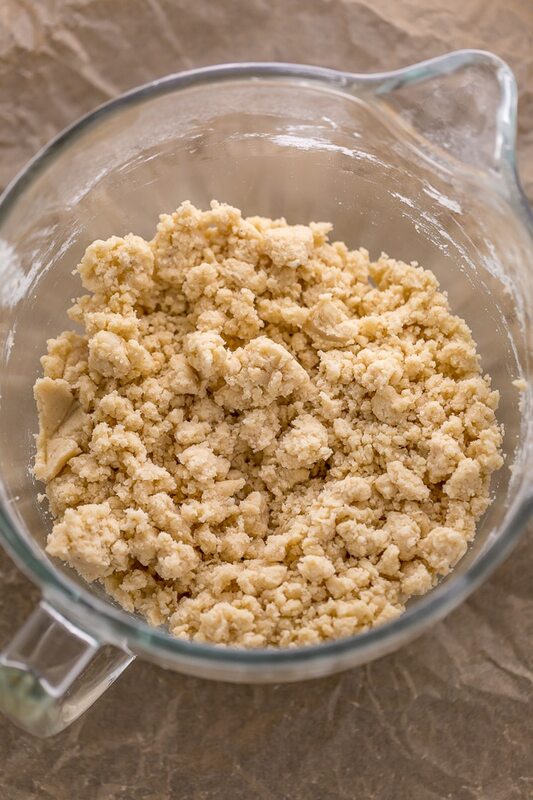 If the cookie dough is too crumbly to hold together, add an extra teaspoon or two of milk. To make these cookies look like pie slices I cut them out with a candy corn shaped cookie cutter. Once the cookies were baked and cooled, I filled a small piping bottle with orange icing and drew an outline around each cookie. Once that set (it took about 1 hour), I flooded each cookie with the orange icing and set them aside again to set (this time it took closer to 2 hours). Once the cookies were set, I filled one piping bag with stiff white frosting and another one with stiff tan icing. I then piped a swirl of white in the center of each cookie (to look like whipped cream) and a zigzag of tan frosting at the top of each cookie (to look like crust). Then I allowed the cookies to sit at room temperature until the icing set, about 4 hours. To create the orange icing I used a combination of red, yellow, brown, and gold food coloring. I began with one drop of each color, then added more until I reached my desired hue. I added these colors to a simple confectioners’ sugar icing, which is easy to pipe and flood onto the cookies. For the tan frosting I used a combination of gold, yellow, purple, and brown. I started out with two drops of gold and yellow and continued adding additional drops until the base was a deep golden color. Then I added one drop of each purple and brown, and continued adding until I reached my desired hue. I added these colors to a thick royal icing, which is stiff enough to pipe onto the cookies. You can make one batch, then divide it into two bowls and color each as needed. I used this kit to pipe the whipped cream and crust onto the cookies. If you try this recipe for Pumpkin Spice Cut-Out Cookies, leave a comment below and don’t forget to snap a pic and tag it #bakerbynature on instagram! 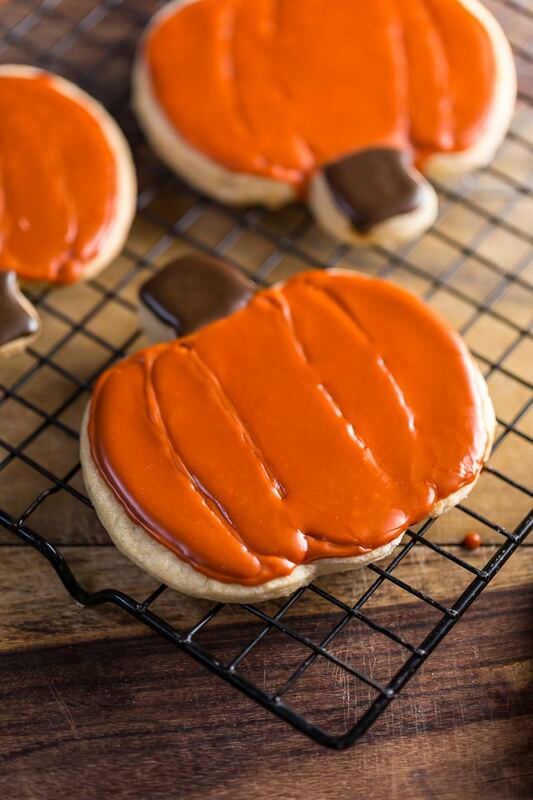 Fun and festive Pumpkin Spice Cut-Out Cookies are the perfect Fall treat! No cookie dough chill time required! Preheat oven to 350 degrees (F). In a medium bowl, whisk together the flour, baking powder, salt, and pumpkin spice until well combined. Set aside. In the bowl of a stand mixer fitted with the paddle attachment, or in a large bowl using a handheld electric mixer, combine the shortening and sugar and beat on high speed until light and fluffy, about 3 to 5 minutes, scraping down the sides of the bowl as needed. Beat in the egg, milk, and vanilla. Reduce the mixer speed to low and gradually beat in the flour, mixing just until combined. 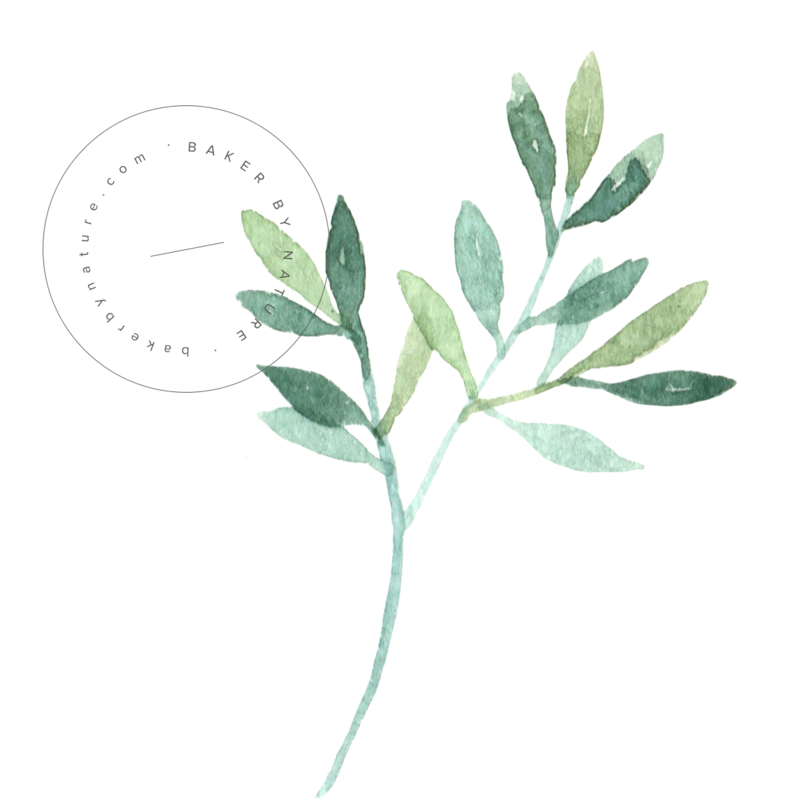 Using lightly floured hands, divide the dough in half. It will be a little crumbly, but will easily come together when pressed. On a lightly floured work surface, roll each half to a 1/4-inch thickness for crispy cookies or 3/8-inch thickness for softer cookies. 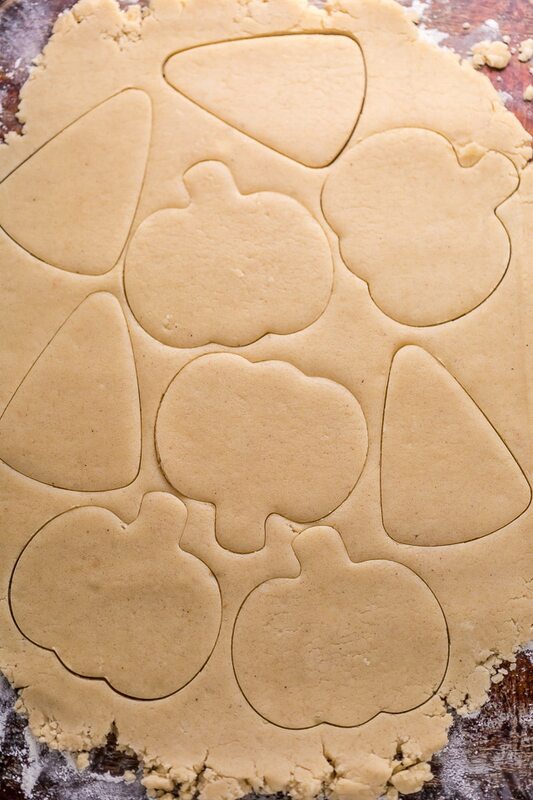 Cut with 3-inch candy corn and pumpkin shaped cookie cutters. Carefully place cookies 2 inches apart on prepared sheets. Bake, one sheet at a time, for 10 to 11 minutes, or until the cookies have puffed up and are golden brown at the edges. Allow cookies to cool for 2 minutes on the baking sheet before transferring them to a cooling rack to cool completely. In a medium bowl, combine the confectioners' sugar, water, salt, and food coloring (if using); whisk well. If the icing appears too thin to hold its shape, add a little more confectioners' sugar; if the icing appears a little too thick to easily pipe, add a little more water. You can play around here until you reach your preferred consistency. Pour the icing into a piping bottle and decorate cookies as desired. In the bowl of a stand mixer fitted with the whisk attachment, or in a large bowl using a handheld electric mixer, beat together the lemon juice and egg whites on low speed until just combined. Gradually add in the confectioners' sugar, about a 1/2 cup at a time, beating well after each addition. Divide the frosting in several bowls, and color as needed. What a wonderful, creative idea! 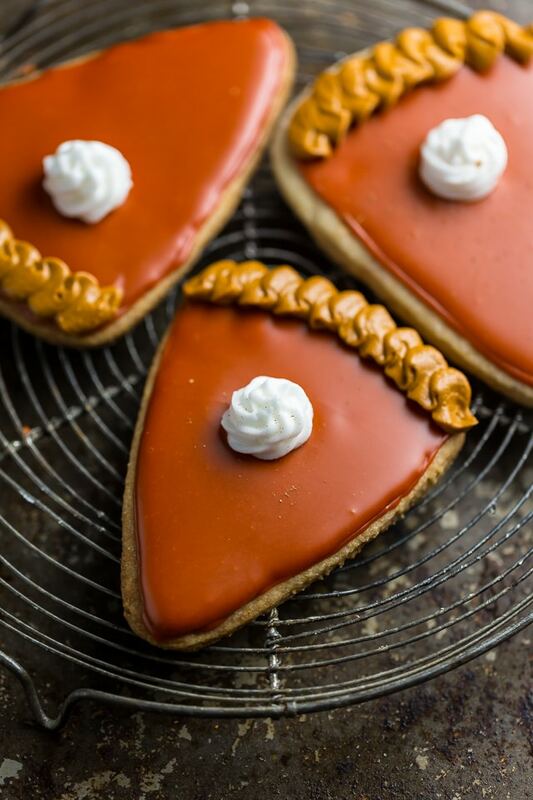 Make a cookie that looks like pie with recipe goodness! Thank you for sharing! Hi! When do you decided to use either the thick or thin icing? 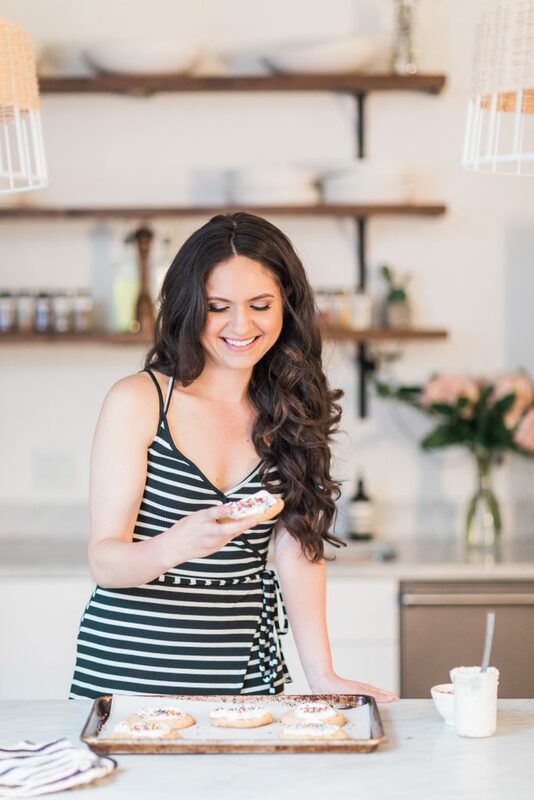 I would love to avoid uncooked egg whites for my allergic son. Thank you. Is it possible to use butter? My daughter is allergic to Soybean oil which is the main ingredient of Crisco.